Seven-time Wimbledon champion Roger Federer will contest his 10th semi-final at The Championships after beating Gilles Simon 6-3, 7-5, 6-2 in a match twice interrupted by rain on Wednesday at the All England Club. On Friday, Federer will play 2013 champion Andy Murray. The 33-year-old Swiss has a perfect 9-0 record in Wimbledon semi-finals and is looking to reach his 26th major final. Federer has only been beaten in the Wimbledon final twice: by Rafael Nadal in 2008 and Novak Djokovic in 2014. Federer won his 17th and most recent Grand Slam championship at the All England Club three years ago, beating Murray in the final. The Swiss is looking to become the first man in history to win eight Wimbledon titles; he has a 78-9 tournament record. "I'm very happy to be in the semis again," said Federer. "The road is long getting here. But still I feel like I'm fresh and I've got energy left in the tank for hopefully a great match with Andy and then we'll see. But I'm looking forward to it. "It's been good so far. I felt like I played a very solid last year or so, especially on the grass I've done very well. I'm happy to keep it up here now. This is obviously now crunch time when you want to show if your game's really up to par." At the age of 30, World No. 13 Simon was bidding to reach his first Grand Slam semi-final, but could not find a way past Federer, whom he has now lost to six times in a row (2-6 ATP Head to Head record). On No. 1 Court for the first time at the 2015 Championships, Federer raced out to a 3-0 start, before the match was interrupted by a heavy rain shower. Play resumed 37 minutes later, but there was little Simon could do to halt Federer’s progress. With actor Bradley Cooper seated beside Federer’s wife, Mirka, the Basel native claimed the first set in just under 30 minutes, having hit 15 winners and lost only seven points on serve. Federer looked to have made a decisive move in the second set with a service break in the seventh game. But, serving for the set at 5-4, Simon raised his level to engineer a break back to love. It ended a run of 116 successive service holds for Federer, dating back to his first-round match with Philipp Kohlschreiber at the Gerry Weber Open in Halle. But Simon’s fightback was shortlived. 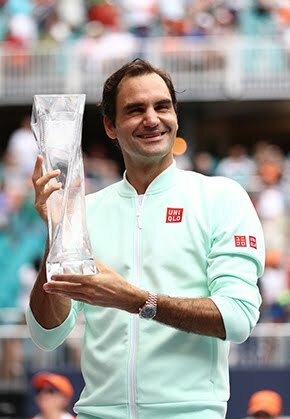 Federer immediately recouped the advantage with a break in the 11th game and had won the first point of the 12th game when another heavy rain shower forced the players off court. Play restarted less than an hour later and Federer was ruthless, hitting three service winners to claim the second set. 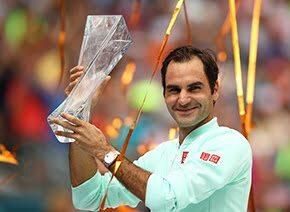 Federer rode his momentum into the third set, breaking Simon immediately to establish an early and ultimately decisive lead. The right-hander broke again in the seventh game and went on to seal victory in one hour and 34 minutes. "Those conditions are never easy for either player; it was quite windy too," said Federer to the BBC. "The stop and gos are tough, but I used them to my advantage. I either stayed ahead or made a difference. The breaks helped me rather than hindered me. "I had a great service game after the second rain delay and reset and took the lead in the third set. The game I got broken he was too good, so I have no problem accepting that." "I think Roger played a great match, especially on the serve," said Simon. "I had a lot of pressure because of that. From the first point in the match, he served perfect. He never gave me any occasion. The only break I did was really good. I just played a perfect game to break him. But I really felt it would be hard to break him."